Did you know that from April 21st 2015, Google will start ranking mobile-friendly (responsive) websites higher in searches on phones or tablets. Mobile search makes up nearly 75% of all searches done on Google. From April 21st 2015, searches from mobile devices will show websites that are mobile-friendly higher up the results than those which are not. Is your website mobile-friendly? Google has built a tool to test your website's mobile compatability. Simple input your domain name and it will run a mobile test for you. What if it is not mobile-friendly? Ask your developer to start optimizing your website for mobile. 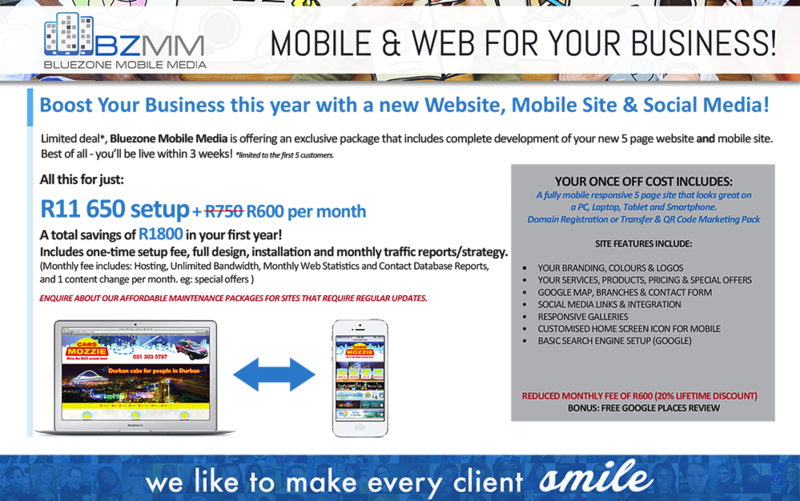 Get Bluezone Mobile Media to redesign your website, and maintain it from only R600 per month. Basically a brand new website in just 2 to 3 weeks!